, an English historical and miscella* neous writer, was born in 1724 or 1725, it is thought at Shrewsbury, but descended from a family of that name in Bedfordshire. He was first placed under an officer of the excise in the North of England, but having, in 1745, joined the rebel army, he was dismissed from his situation. He then went over to Dublin to visit Ambrose Philips the poet, who was his relation, but, owing to Philips’s death soon after, failed of procuring any establishment in that country. While in Ireland he is said to have published Akenside’s “Pleasures of the Imagination,” as his own, but his biographer has refuted this story. He probably, by more honourable means, recommended himself to persons of distinction, as his poem, entitled “Cambria” was, when first written, intended to have been patronized by sir Watkin Williams Wynne, and when corrected and prepared for the press, as it now stands, was shewn to Frederic prince of Wales, by general Oglethorpe and lord Middlesex; by whose interest he had permission to dedicate it to prince George, his present majesty, when it was printed, in 1749, in 4to. On the 25th of September of the same year, sir Watkin Williams Wynne was killed by a fall from his horse; and in the following month Roft published a poem to his memory, which was highly admired, and very popular among his countrymen. By the above-mentioned, and some other eminent persons, Rolt was encouraged to undertake his “History of the general War” which terminated in 1748. This was published in four successive volumes, octavo, and procured him a correspondence with Voltaire, who sent him some flattering letters. He was also engaged to write the “Life of John earl of Craufurd,” an officer of distinction. The above publications do him no discredit; and he shewed considerable ability in defending the case of Clifford against the Dutch West India company, and in a reply to the answers of the Dutch civilians in that case as also in a | series of letters concerning the Antigallican privateer and prize, which had been illegally seized and confiscated by the Spaniards. Being an author by profession, he was constantly employed by the booksellers in successive compilations, historical, commercial, &c. and in periodical publications, in which he was concerned with Smart and others. In one of these, “The Universal Visitor,” he and Smart are said to have been bound by a contract to engage in no other undertaking, and that this contract was to remain in force u for the term of ninety-nine years.“So absurd an engagement, if it ever existed, could not be supposed to last long. Rolt, who had no other resources but from his pen, was not to be confined in his employment, which in one instance was thought rather singular, but more recent times have afforded many similar impositions. Mr. Woodington, a relation of his wife, being in India, became acquainted with captain John Northall, of the royal regiment of artillery, the second in command at the siege of Surat, where he died of an apoplectic fit in the march to that city in February 1759. This gentleman, having been stationed at Minorca, had made an excursion, in 1753, to Italy, of which he completed an entire tour; and being a man of curiosity and taste, noted down in his pocket-book all the fine pictures, statues, &c. with such remarks as everywhere occurred to him. This pocket-book fell into the hands of Mr. Woodington who, at his return to England, gave it to Rolt, and he from this manuscript journal, with the help of former printed travels, compiled a large octavo volume, which he published under the title of” Travels through Italy; containing new and curious Observations on that country with the most authentic Account yet published of capital Pieces in Painting, Sculpture, and Architecture, that are to be seen in Italy. By John Northall, esq." c. &c. &c. 1766. 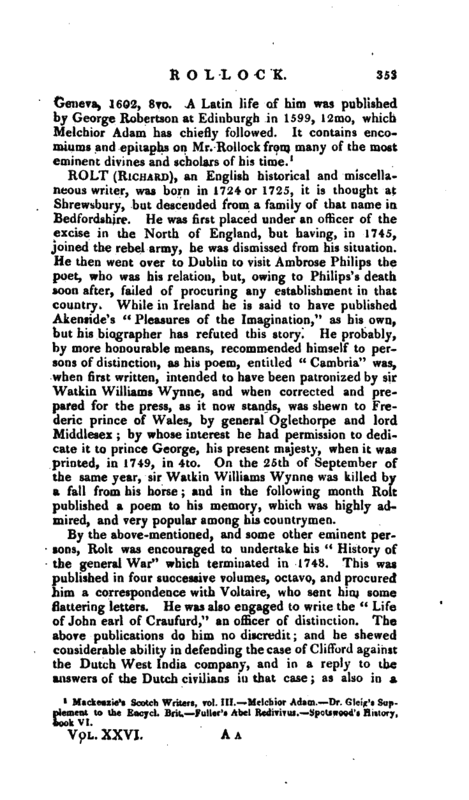 The proposals for printing, by subscription, his poetical works, was the last attempt of Mr. Rolt, who died March 2, 1770, aged 45 having had two wives, by each of whom he left a daughter. To his second wife, who survived him many years, and who, by her mother, was descended from the Percys of Worcester, the late bishop of Dromore, to whom she was thus related, allowed a pension to her death. 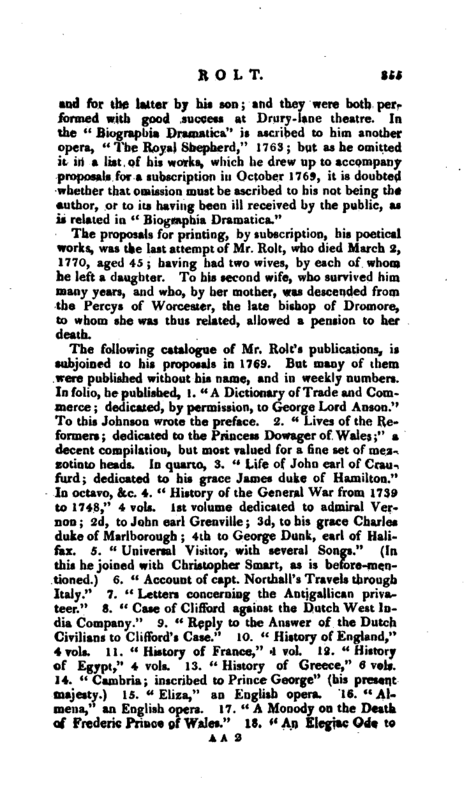 The following catalogue of Mr. Rolt’s publications, is subjoined to his proposals in 1769. But many of them were published without his name, and in weekly numbers. In folio, he published, 1. “A Dictionary of Trade and Commerce; dedicated, by permission, to George Lord Anson.” To this Johnson wrote the preface. 2. “Lives of the Reformers dedicated to the Princess Dowager of Wales” a decent compilation, but most valued for a fine set of mezzotinto heads. In quarto, 3. “Life of John earl of Craufurd; dedicated to his grace James duke of Hamilton.” In octavo, &c. 4. <f History of the General War from 1733 to 1748,“4 vols. 1st volume dedicated to admiral Vernon; 2d, to John earl Grenville; 3d, to his grace Charley duke of Marlborough; 4th to George Dunk, earl of Halifax. 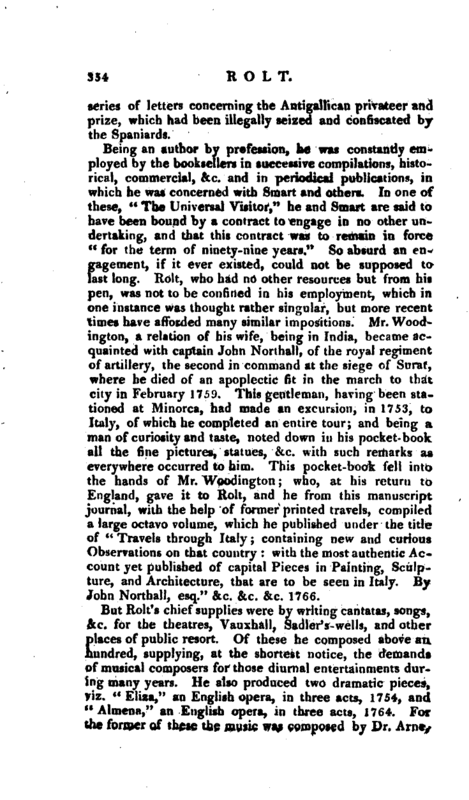 5.” Universal Visitor, with several Songs.“(la this he joined with Christopher Smart, as is before-mentioned.) 6.” Account of capt. Northall’s Travels through Italy.“7.” Letters concerning the Antigallican privateer.“8.” Case of Clifford against the Dutch West India Company.“9.” Reply to the Anssver of the Dutch Civilians to Clifford’s Case.“10.” History of England,“4 vols. 11.” History of France,“vol. 12.” History of Egypt,“4 vols. 13.” History of Greece,“6 vols. 14.” Cambria; inscribed to Prince George“(his present majesty.) 15.” Eliza,“an English opera. 16.” Aljnena,“an English opera. 17.” A Monody on the Dqath oC Frederic Priace of Wales.“18.” An Elegiac Ode t* | the memory of Edward Augustus, Duke of York.“19.” A Poem on the Death of sir Watkin Williams Wynne, bart.“20.” Shakspeare in Elysium to Mr. Garrick.“21.” The Ancient Rosciad," published in 1753. 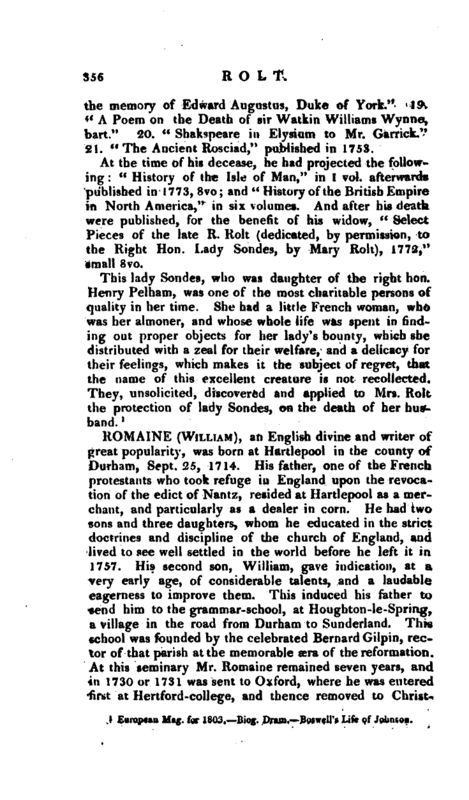 At the time of his decease, he had projected the following: “History of the Isle of Man,” in 1 vol. afterwards published in 1773, 8vo; and “History of the British Empire in North America,” in six volumes. And after his death were published, for the benefit of his widow, “Select Pieces of the late R. Rolt (dedicated, by permission, to the Right Hon. Lady Sondes, by Mary Rolt), 1772,” small 8vo. European Mag. for 1803. Biog. Dram. —Boswell’s Life of Johnson.